In need of some good old Irish luck? Find the pot of gold at the end of the rainbow with The Leprechaun King, a 5 reel, 60 payline new online slot by High 5 Games available. The Leprechaun King has a magical Irish theme featuring many little leprechauns and lucky items including four-leaf clovers and horseshoes. The design is beautiful and fairytale-like set in a magical leprechaun kingdom with lots of stars and shamrocks. The Leprechaun King treats us to many delightful features including a free games bonus, catch the leprechaun bonus, and jackpot. Will the lucky Irish leprechauns bring you lots of luck and slots bonuses today? Click spin to find out! 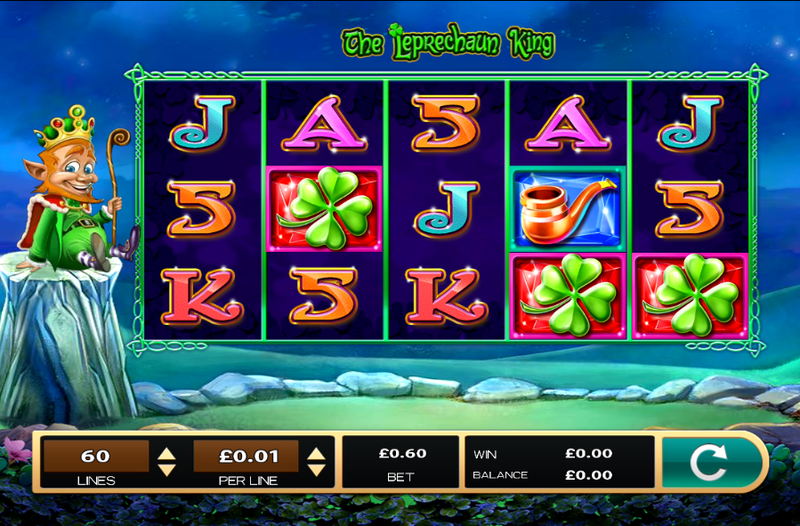 The leprechaun king is a 5 reel, 60 payline slot created by High 5 Games with an Irish theme. Join the leprechaun king and explore through the mystical kingdom to find rainbows, rare gems, and a whole lot of gold. The design is very bright and sparkly and the 3D animated leprechaun is truly adorable. Behind the reels, you'll see a little Irish townhome to hundreds of leprechauns. The forest is surrounded by many lucky four-leaf clovers and is covered by a whimsical twinkly diamond sky. The cheeky king leprechaun can be seen on the left side of the reel, sitting high up on a tree stump. He gives out a cheeky wink or two as you play! Symbols include four-leaf clovers, horseshoes, and pipes. Of course, like with any Irish luck-themed slot, a cheery Irish tune can be heard while you play. The Wild Symbol - The wild symbol is the rainbow. This replaces all other symbols bar the scatter to make winning combinations. The Scatter Symbol - The scatter symbol in this slot is the crown. This scatter only appears on reels 2, 3 and 4 and unlocks the bonus select feature. The Bonus Select Feature - Once you have activated the bonus select feature, you will pick from either free spins or the leprechaun pick bonus. Choosing free spins will award you with 8 free games. Selecting the leprechaun pick bonus will trigger a wheel spin which will randomly give 3, 4, or 5 picks. Jackpot - Landing 3 wilds will activate the jackpot. Landing 3 wilds will award the minor jackpot of 3, 000x your total stake, landing 4 wilds will award the major jackpot or 30, 000x your total stake, and landing 5 wilds will activate the grand jackpot awarding you with 120, 000x your total stake. High 5 Games are one of the leading online slot providers in the iGaming industry and are known for their creative and innovative games. Their games are hugely popular with many game players around the world because they are so engaging and unique. 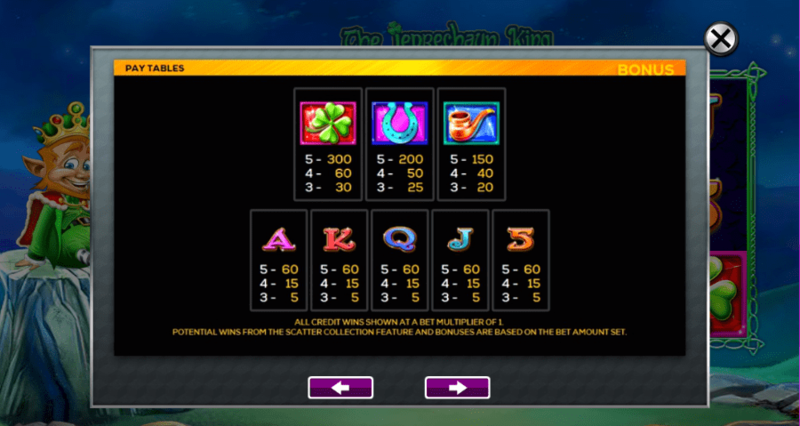 If you like Irish luck-themed slots, then you will love The Leprechaun King. Like all other Irish slots, The Leprechaun King has lots of magic, gold, and a rainbow-coloured design the luckiest place to use your games promotions. This online slot has plenty of exciting gold coin-filled features which will bring you lots of luck. The biggest prizes are held within the jackpot - you could win up to 120, 000x your total stake here!